In Holmhead Cottage on Hadrian's Wall, you are literally sleeping on a World Heritage Site. The foundations of the original wall run directly beneath the building and the 200-year-old farmhouse was constructed with Wall stone. Just a two-minute stroll from the back door of Holmhead Cottage on Hadrian's Wall are the spectacular remains of Thirlwall Castle. 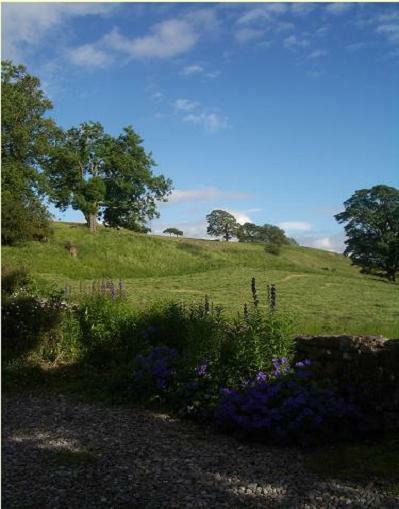 From the back gate at Holmhead Cottage on Hadrian's Wall, you step directly on to two National Trails; The Hadrian's Wall Path and The Pennine Way. Just over half a mile east along the trail is The Roman Army Museum - with many interesting displays and a 3D film - where you can immerse yourself in the life of a Roman soldier. About 7 miles along the trail, or a short car or bus journey will get you to Roman Vindolanda the only place on Hadrian's Wall to see archaeologists at work uncovering Roman life before your eyes! In the museum, you can see The Vindolanda Tablets. Voted Britain's Top Treasure - these precious postcards from the past have been preserved by history to be rediscovered by you today. 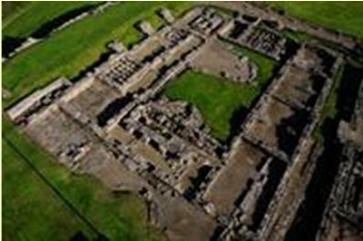 Ten miles east on the Hadrian's Wall trail is Housesteads-the most complete Roman fort in Britain. Set where Hadrian's Wall climbs to the top of a dramatic escarpment, there are some stunning views to enjoy from the walls of this ancient fortress. 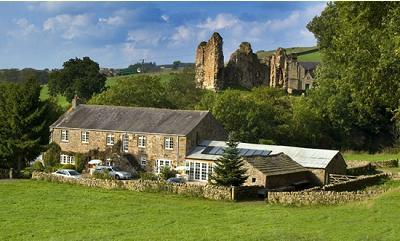 At the other end of the dramatic central section of the Hadrian's Wall Trail-about 15 miles away is Chesters. Built almost 2000 years ago to house a Roman army garrison guarding the nearby bridge across the River Tyne, Chesters Roman Fort is the best preserved Roman cavalry fort in Britain. 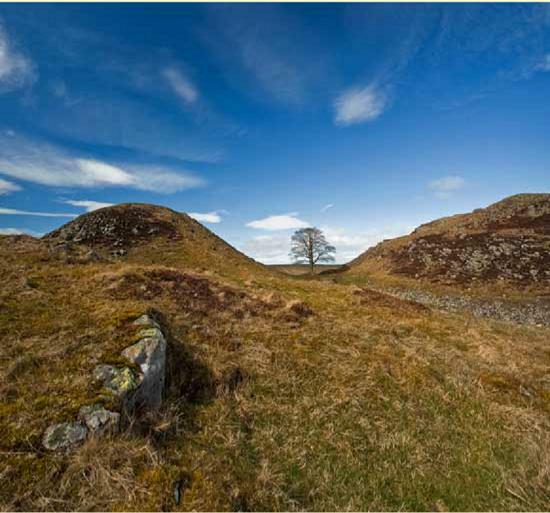 Walking west from Holmhead Cottage on Hadrian's Wall, the terrain is a little gentler and within 3 miles, you can visit the remains of the milecastle at Poltross Burn. A little further and you an see the remains of the original Roman bridge which crossed the River Irthing at Willowford. Nearby is one of the longest continuous stretches of remaining wall-just after Birdoswald -the remains of an extensive Roman Fort. a wild and turbulent past. It is an Anglican church and regular services are still held in the Priory, as they have been for almost 850 years. All the major Roman sites along Hadrian' s Wall are accessible on the AD122 bus - a service which runs from Easter to late October. 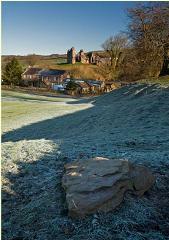 Use the service to reach the attractions or simply to make your return journey after a walk along the Wall. The AD122 stops in the centre of Greenhead-just half a mile from Holmhead Cottage on Hadrian's Wall. Holmhead Cottage on Hadrian's Wall sits in a quiet valley, sandwiched between the rugged beauty of the Northumberland National Park and England's last wilderness, the spectacular North Pennines Area of Outstanding Natural Beauty. The beautiful Northumberland coastline (some say Britain's finest) is within 90 minutes by car. Within the same time, you can be in the centre of Durham, admiring the views of its magnificent Cathedral (another World Heritage Site) or visiting the unique Beamish Museum-a living guide to the fascinating history of North East Industry. The various attractions along the wall have plenty of activities and features to hold the attention of younger visitors. There are other attractions nearby; there's a farm with kiddies' activities or they can go down a lead mine at nearby Killhope or Nenthead. In Haltwhistle, there is one of the largest open-air swimming pools in the country and, nearby, it is possible to hire a private pool in the centre of some beautiful woodland. There is a wealth of information in the cottage for guests. ...if you really must shop! There is a great choice of local pubs and restaurants with varied menus from bar snacks to fine dining. Most serve up a selection of dishes using local produce. For eating in, nearby Haltwhistle has a number of local shops selling excellent local produce - including butchers, delicatessen, fishmonger and greengrocer and there are also two supermarkets with late shopping hours. Further afield, Hexham and Carlisle (both about 40 minutes' drive)have a choice of large supermarkets-including 24 hr opening. 'Robin Hood, Prince of Thieves', starring Kevin Costner.